Colossus is undoubtedly one of the coolest members of the X-Men, and has been a prominent one at that, but for whatever reason, he always seems to draw the short stick when it comes to media adaptations. Well, at least the Deadpool movies have helped there, right? 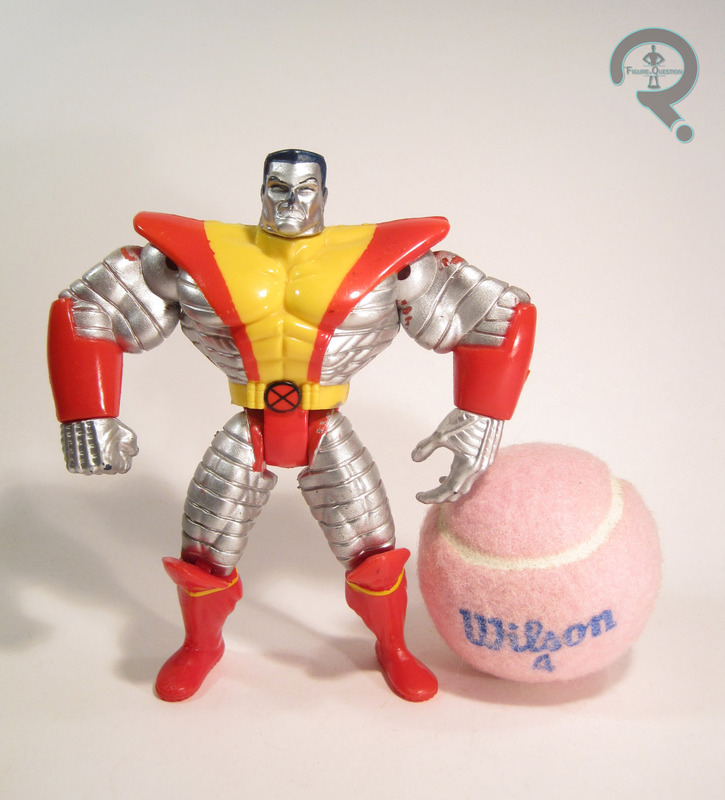 Colossus was released in the “Battle Brigade” series, the 14th series of Toy Biz’s X-Men line. 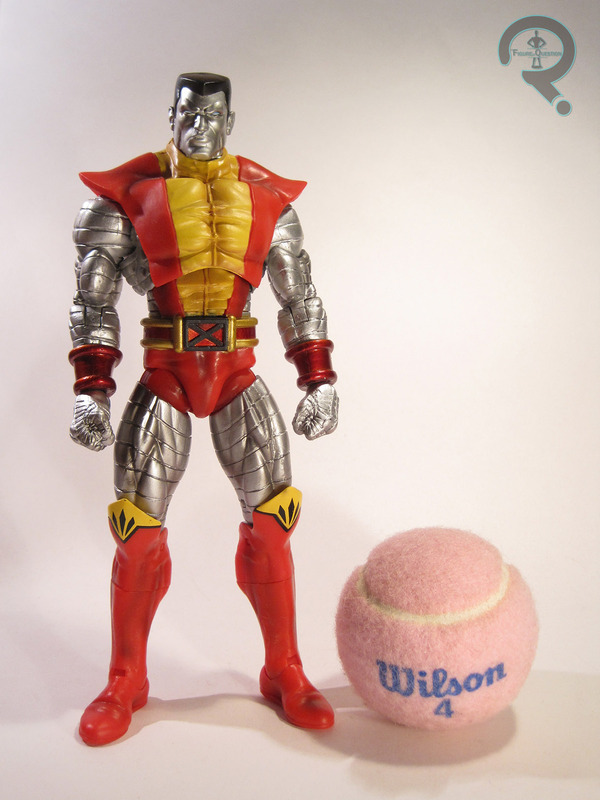 It would mark Colossus’ second figure in the line, following his appearance in Series 1. That figure was more classically inspired, while this one aims more for the super exaggerated, rather imposing Colossus that’s become all the rage since the ‘90s, meaning he fits in a little better with the line’s post Series 10 direction. The figure stands 5 1/2 inches tall and he has 11 points of articulation. While he lacks elbow movement, he does instead get a much wider range of motion on his shoulders, as well as cut joints on his wrists, which seems like a decent enough trade off to me. 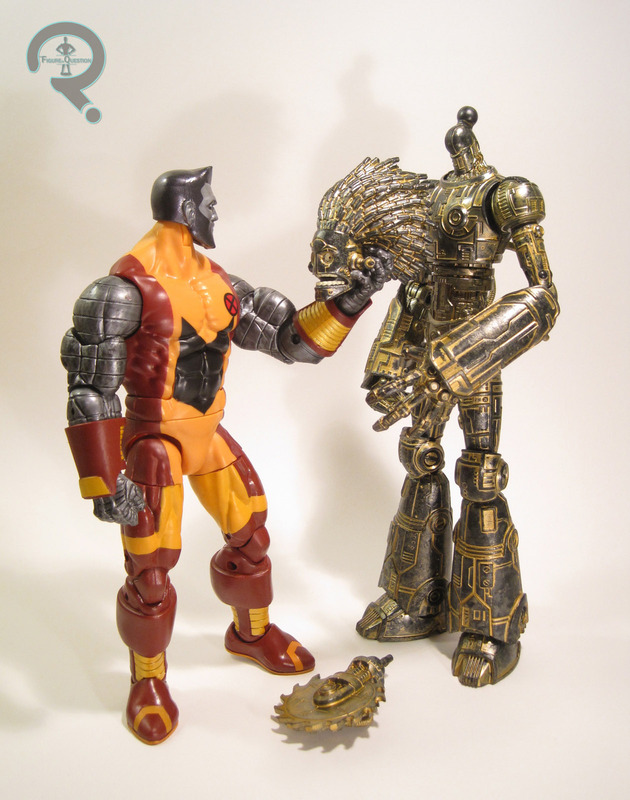 Colossus’ sculpt was all-new, and it’s certainly…something. I’m not entirely sure what. He’s definitely large. He’s definitely imposing. 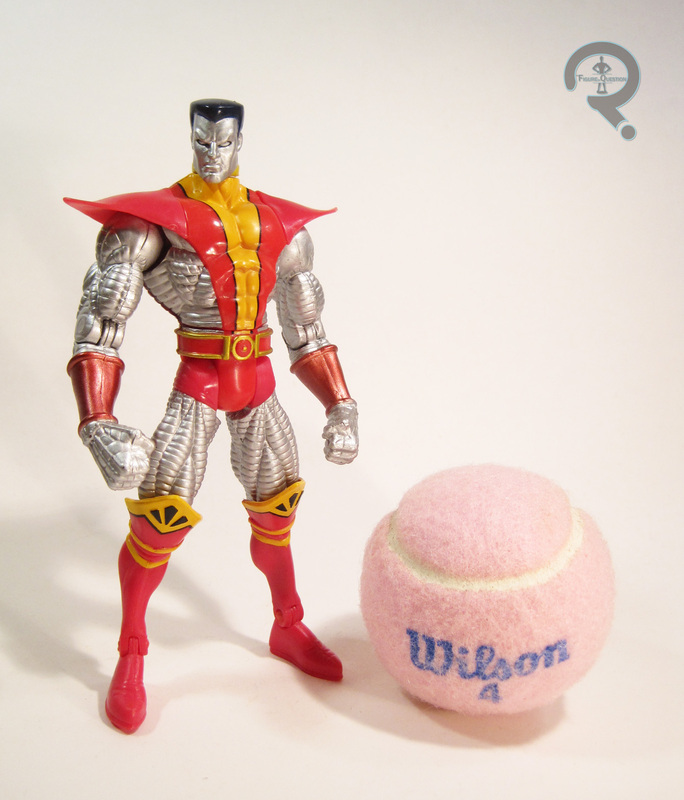 But he seems a little wide for Colossus, at least by my eye. There are, of course, a number of different interpretations of the character, but I can’t say this really matches up with any of the ones I’m really familiar with. Something about the facial expression seems very un-Colossus-like to me. I don’t dislike it, but he feels a little off. Also, can we address that his hands are bigger than his waist? That’s definitely a new issue for Colossus, who had traditionally been pretty thick in the trunk. This…like I said, this is off. (quoth Super Awesome Fiancee: “He’s a Dorito”). The one area of the figure that’s decidedly not odd is the paint, which is actually pretty respectable…or at least it was before foolish child Ethan took him and played with him, thereby messing up a lot of the silver. Why would I do that? That’s so irresponsible! Colossus was packed with an assortment of clip-on armor, which I don’t feel he’d have much use for, but hey, there it is. Colossus didn’t begin as my figure. 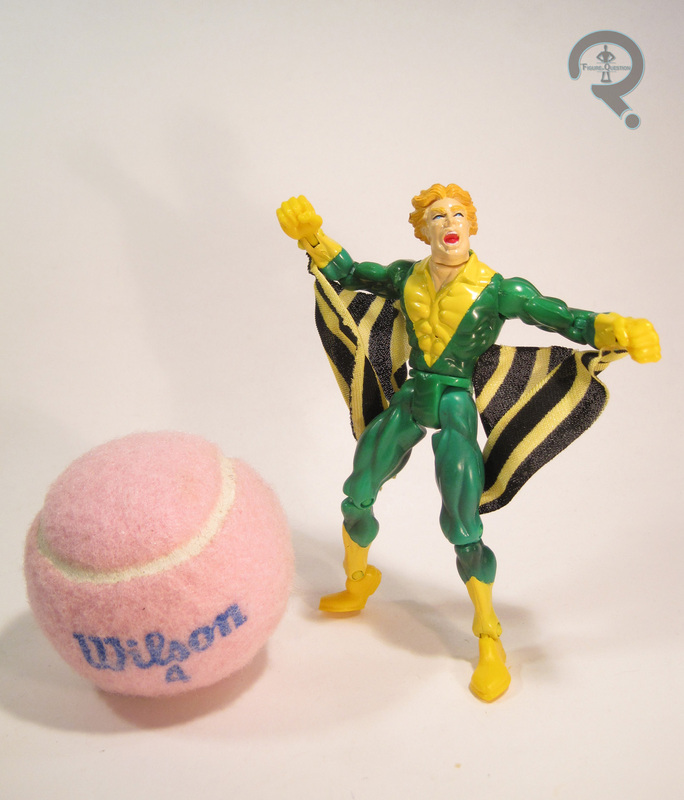 He was actually my Dad’s, purchased alongside the Archangel from this same assortment, in one of the earliest memories I have of us getting figures right from the case. 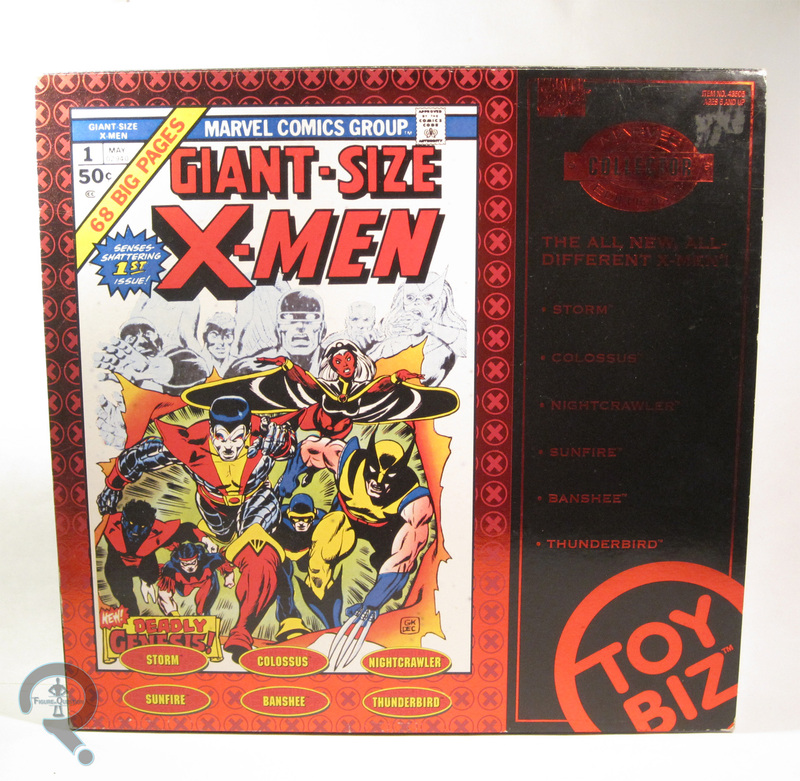 When my Dad got the Collector Editions Giant-Sized X-Men set, he upgraded to that Colossus, and I got this one. Admittedly, not the best of the Colossuses to be offered by Toy Biz in this era, but he has his own sort of awkward charm. Does he really turn into steel? That doesn’t seem right. Sorry, critiquing the bio again. Gotta stop with that; it only leads to madness. 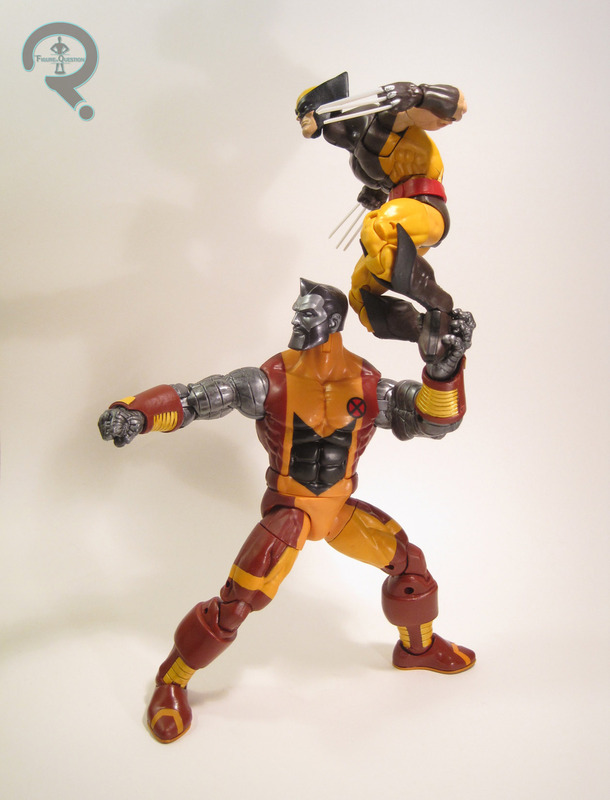 Today, I’ll be continuing my look at the latest X-Men-themed series of Marvel Legends, with a look at everyone’s favorite metal skinned Russian, Piotr Rasputin, aka Colossus! 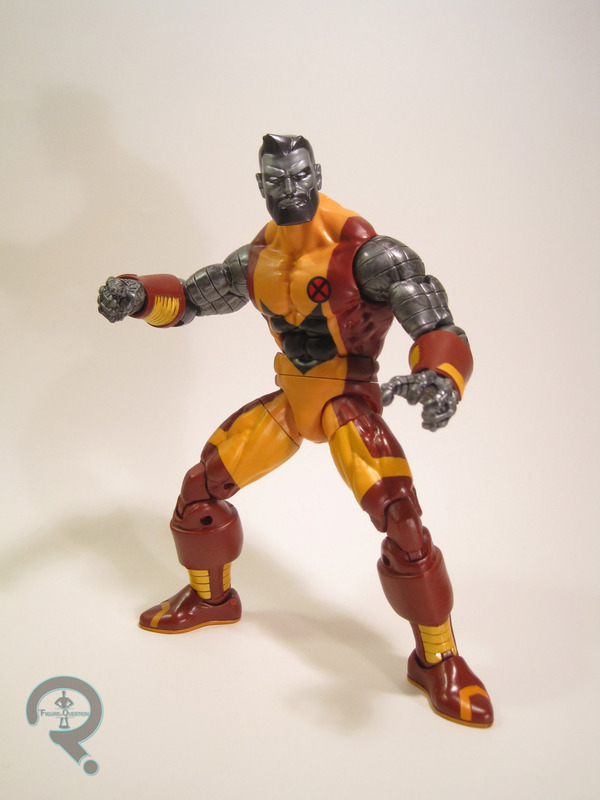 Colossus is figure 1 in the Warlock Series of Marvel Legends. 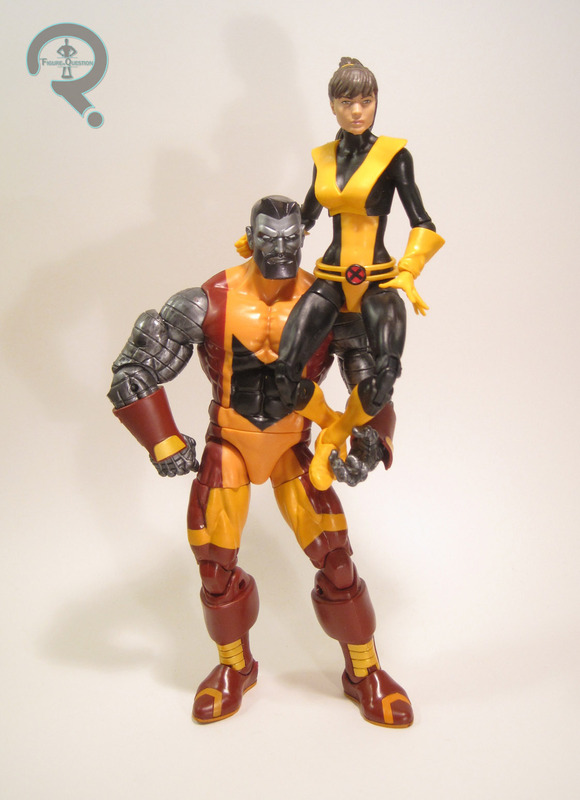 This is Colossus’s third time as a Legends release, but the last one was an X3 figure, meaning there’s only one prior comic Colossus, who was released a whopping 14 years ago. Needless to say, an update was long overdue. Colossus is presented here in his costume from the Utopia era of X-Men, which is…well it’s hardly anyone’s first choice. 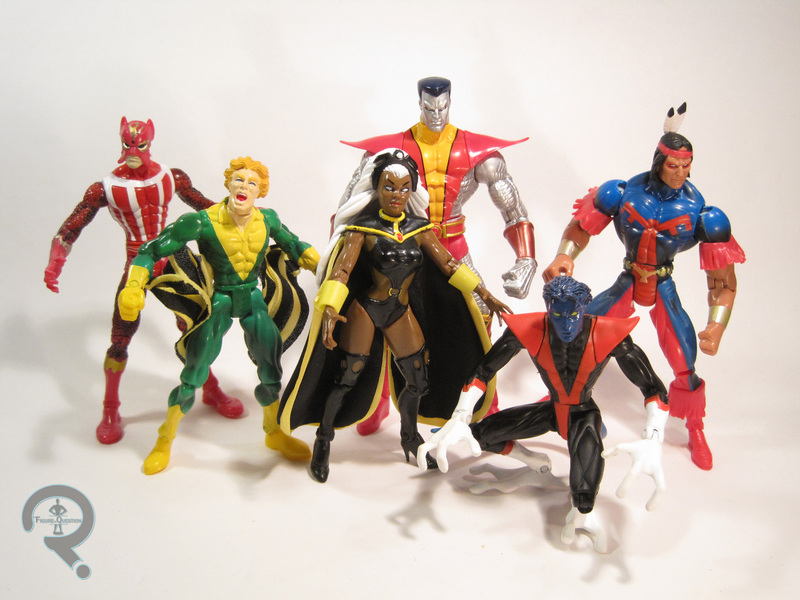 Hasbro’s released a handful of characters from this era (last series’ Kitty Pryde figure is one, technically), so it’s not like he won’t fit in, but it’s also not one of his more more memorable designs, and looks a tad more generic than some of the others. The thing that really bugs me about it is the black chevron on the torso. Why is it there? As it stands, it really just looks like an arrow pointing to his crotch, which is just odd. Without that, I think it’d be a lot better. It’s worth noting that this is the design that got used for Avengers Alliance, which seems to be a major influence on Hasbro’s costume choices. There’s also a good chance that we’re seeing something of a trial run with this figure, and that a more classic Colossus will show up in short order. The figure stands just shy of 8 inches tall and he has 30 points of articulation. Colossus is debuting a new base body, which looks to be a replacement for the Wrecking Crew body in terms of scaling. It’s about at the mid-point between Hyperion and Terrax. It’s a pretty decent sculpt, with a nice, solid foundation. It feels a little lightweight to me, but it’s certainly a step-up from the bodies on either side of it. I look forward to seeing what else it might be used for. 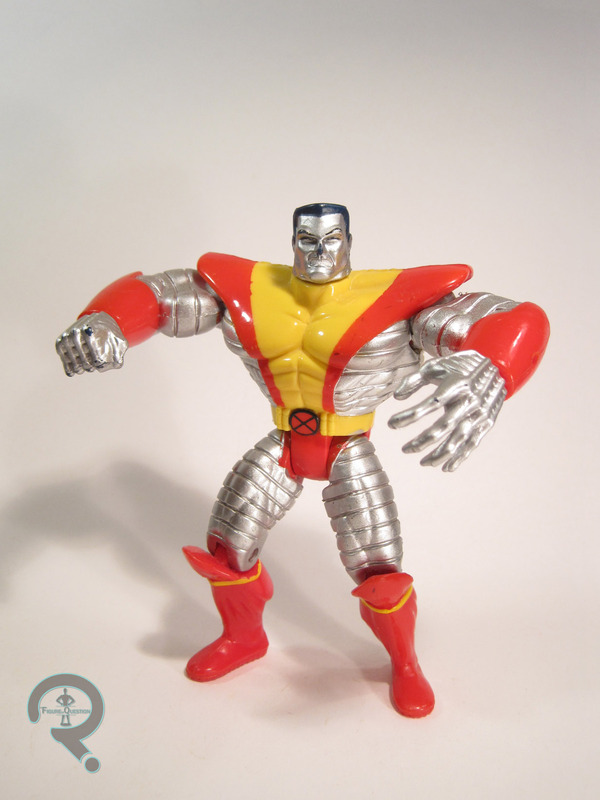 Colossus gets character specific arms and boots, as well as an all-new head. The arms are really nice, and I quite like the posing on the hands. The bracers are separate pieces, so clearly Hasbro’s made it easy to swap them out should these arms be used for one of the other Colossus designs. The boots are a decent enough recreation of the comic design, but for me the best part of them is how flat the bottoms are; this guy is really sturdy on his feet once you get them posed the right way. The basic head is an okay piece on it’s own, but it sits a little high on the neck for my taste. Some people have modded it so that the socket for the neck peg is a little further in, and it definitely improves the overall appearance, but it’s a slight bummer that he isn’t quite correct right out of the box. Fortunately, there’s also a second head included. This one is based on Piotr’s bearded look from Extraordinary X-Men, which is suitably unique. The beard’s a good look for him, and the head sits a lot better on the neck. This will definitely be my go-to for this figure. The paint on Colossus is pretty solid overall. The best work is definitely on the metallic skin, which is not only clean, but also gets some great accent work. The costume is a bit more prone to slop here and there, though nothing too bad. It’s nice and bright, which is good. In addition to the previously mentioned extra head, Colossus also includes not one, but two pieces of the Build-A-Figure Warlock. One of them is his head, which means there are three heads in the packaging. It doesn’t quite top the last Venom figure with his four heads in one package, but still. As I noted in my Polaris review, I called upon the help of my parents to track down the Warlock Series. While I found a second Polaris, I’ve actually yet to see Piotr at retail, as he’s easily the set’s second most popular after Cyclops. So, this guy got mailed to me (along with a few other awesome figures that’ll be showing up here in short order). The Toy Biz Colossus was easily one of my favorite TB Legends, so this guy had a high bar to clear in that respect. When the figure was first shown, I was a bit letdown by the costume choice, but I think that actually works in his favor. With the new costume and the bearded head, this Colossus is suitably different from the last one, which means he not so much a replacement as he is just a brand new figure. That’s sort of forced me to weigh him on his own merits. He’s definitely a fun figure, and probably my second favorite single release in this series. I look forward to the eventual classic version down the line, but am content with this one for as long as I need to be. 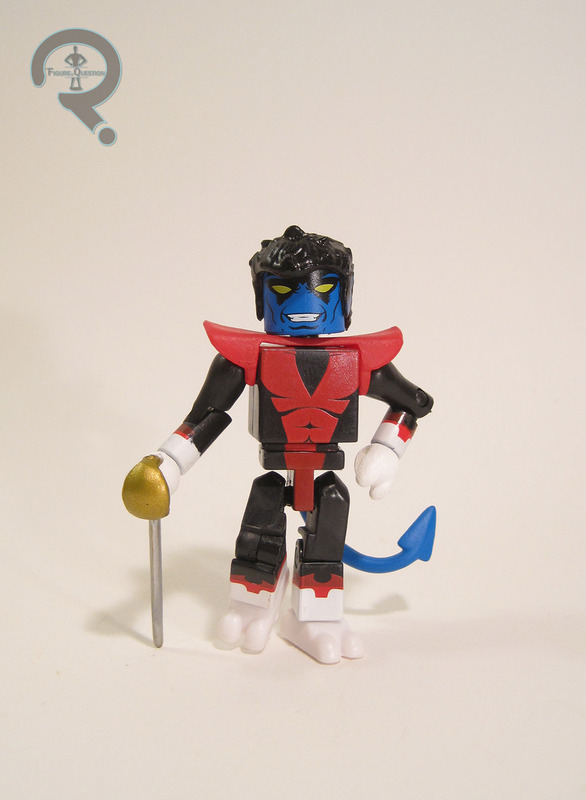 Hey, remember when I reviewed those knock-off Lego mini figures last week? Well, how about one more? Last week’s mini figures were based on Game of Thrones, which is a property that Lego doesn’t, and never plans to, hold the license for. Today’s focus, is a slightly different story, hailing from the Marvel side of things. Of course, it’s still a character that doesn’t yet have an official Lego figure, which is why I’m reviewing a less legitimate version. Without further ado, here’s that merry metal mutant, Colossus! As noted in the intro, this guy’s an unofficial product. As such, he’s not strictly part of any series or assortment. Also, unlike the prior BootLegos, he’s not part of a larger set that I can find. The figure’s about 3 inches tall and has 5 points of articulation (though, there’s not really much movement in the neck, thanks to the hair). If the height didn’t already cue you in, he’s patterned on the “Big Fig” body that was first introduced for the Avengers mover version of the Hulk. While Colossus is usually depicted a little slimmer than the Hulk, this is actually how the character was depicted in Lego Marvel Superheroes, which gives him an extra sense of officialness, since any legit Colossus seems likely to be built this way. What I personally find interesting is the fact that this guy’s a wholly original sculpt. Every other one of these I’ve picked up has uses stock Lego pieces, but this guy’s totally unique. I’m honestly curious if there’s actually a Colossus in the works from Lego, since it just seems odd for this one figure to be all-new. If he really is a unique sculpt, he’s a very good forgery. The sculpt is pretty solidly done, with all of the proper details outlined. The only real issue I have is the hair, which has actual texture, which just doesn’t seem right for Colossus; it really should just be smooth. A closer look at the piece makes it look like it might be an upscaled basic spiky hair piece, modified to fit the body. That would certainly explain the extra details. As nice as the sculpt work is, the paint does seem to be a slight step down. red seems a bit deep in shade, and the edges are all pretty sloppy. 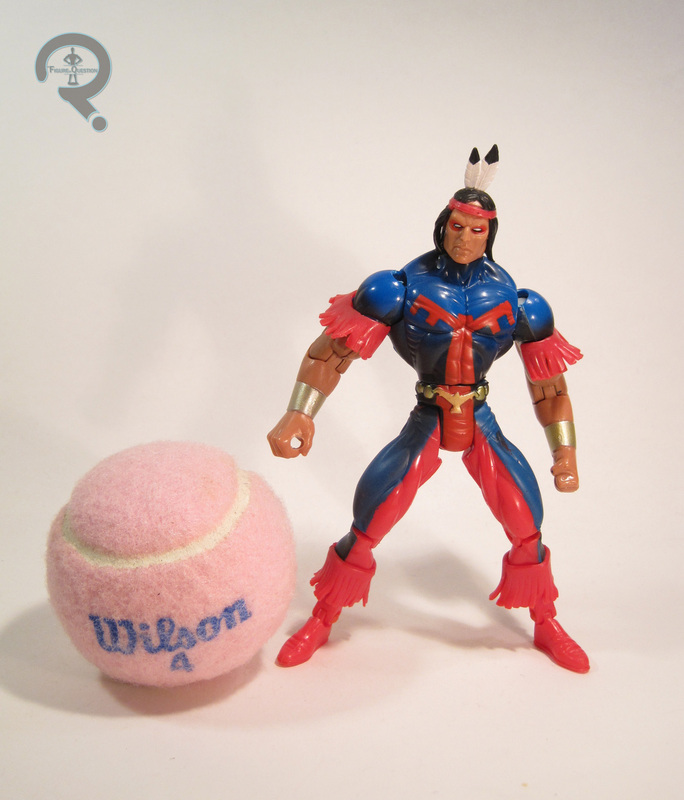 There’s also a splotch of red on his right arm, which is super distracting. Lego’s well-known for their high standards of quality control, so this guy’s lack of said QC kind of shatters the illusion. I mean, he’s not terrible, but he could be better. I picked up this guy at the same time as the GoT mini figures. The vendor had a special deal for three basic mini figures and one Big Fig, which is what I opted to go for. 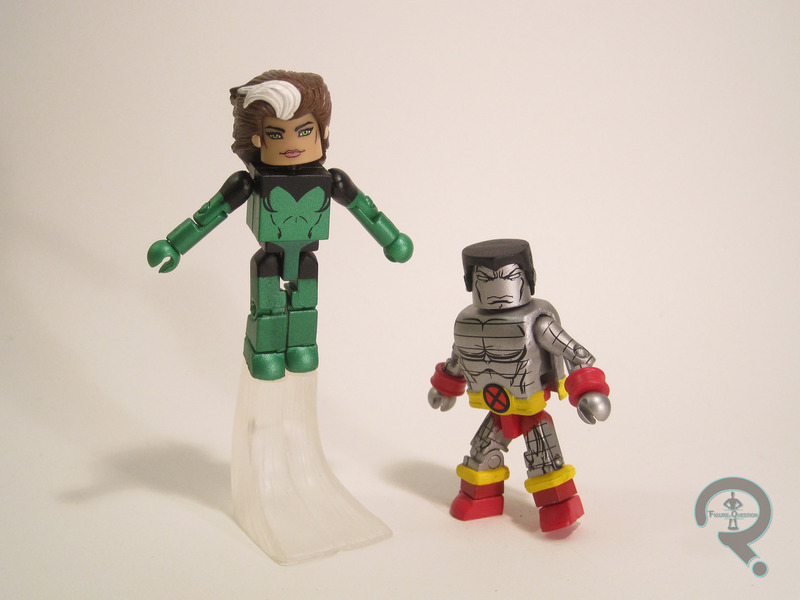 Colossus is one of my favorite X-Men, so I was hardly going to turn down the chance to get a Lego version of him. He’s not quite as good as the other three, but he’s still pretty fun! 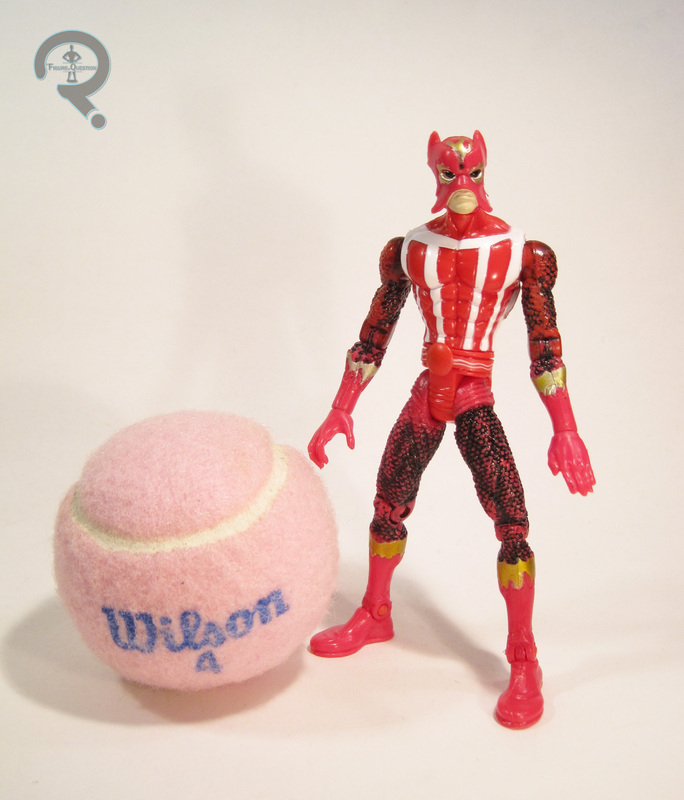 Wow, it’s been a really long time since I’ve reviewed a Marvel Select figure. <Looks back at reviews> Holy crap, it’s been 506 reviews since I last looked at a Marvel Select figure. That’s quite a while. Well, why not pull something out of the archives, then? Today, I’ll be jumping over into the world of Marvel’s merry mutants, the X-Men, and looking at one of my personal favorite members of the team, Piotr Rasputin, aka Colossus. 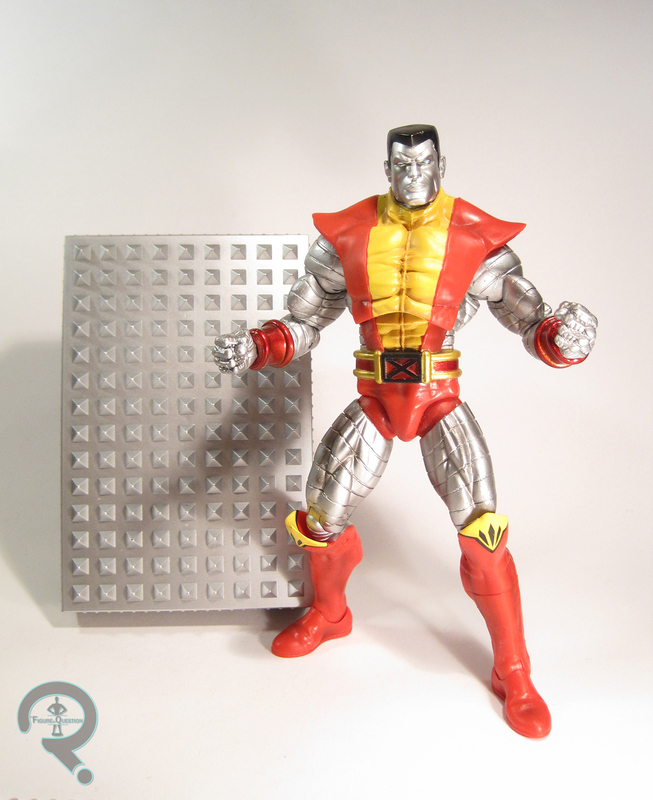 Colossus is the 75th figure in Diamond Select Toys’ Marvel Select line, released in 2012. He’s one of only two figures to hit that year, largely due to the focus on a certain team of Earth’s Mightiest Heroes who happened to have a movie released that year. 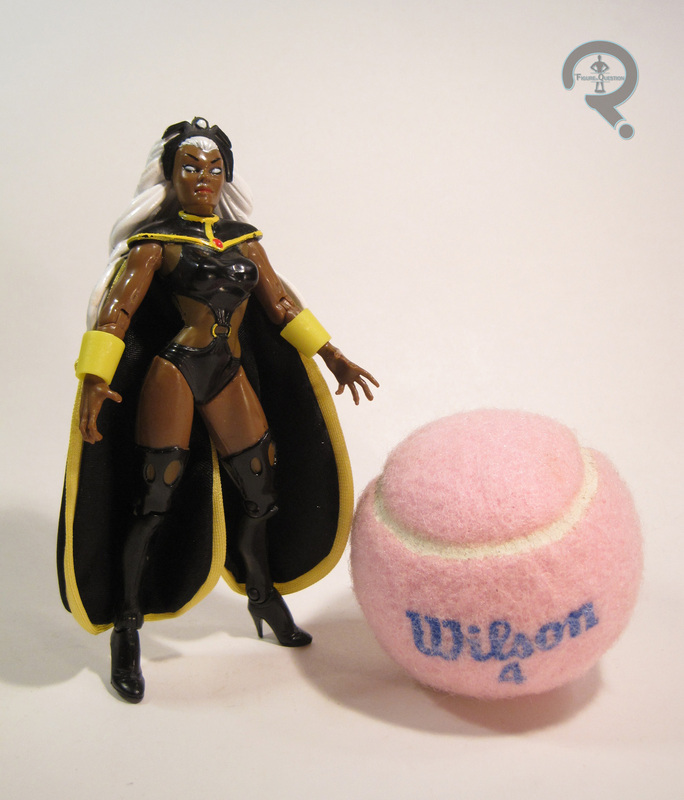 He continued the trend of X-Men based upon the early ‘80s line-up of the team (the other X-Man from 2012, Storm, also followed this trend). The figure stands almost 9 inches tall (he’s a big guy) and he has 30 points of articulation. He’s one of the earlier instances of near-Marvel-Legends levels of articulation for a Select figure, and it’s genuinely impressive just how much movement they were able to get into this guy, given his mass. 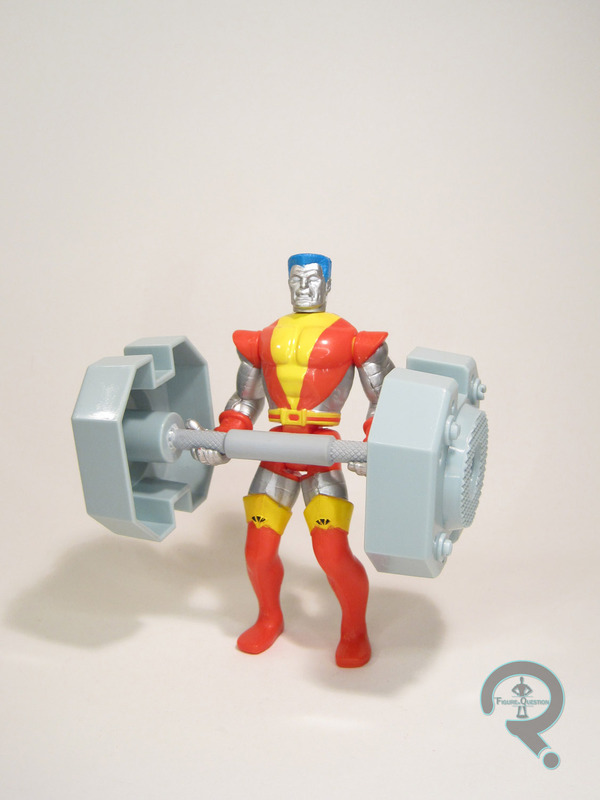 Colossus sported an all-new sculpt. 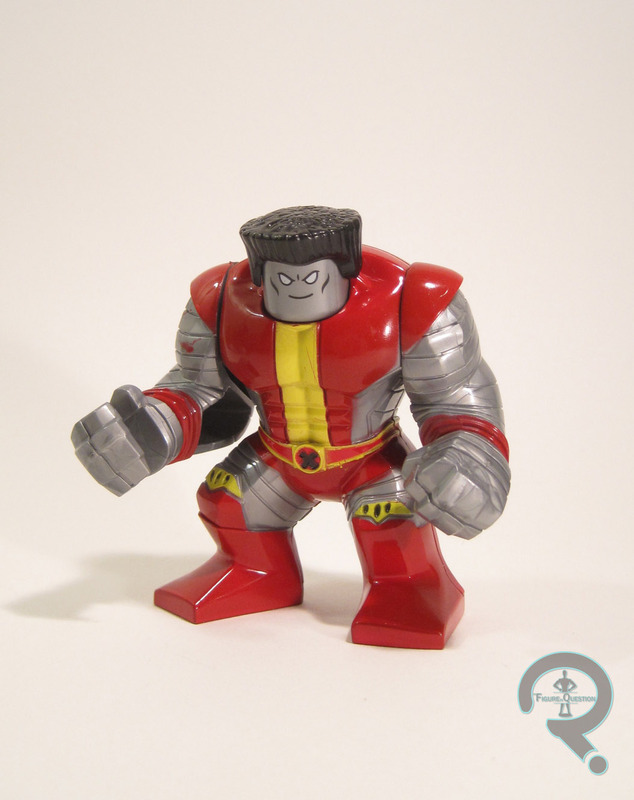 It doesn’t appear to be based on any particular artist’s rendition of Piotr, but it does lean a little more modern in terms of design sensibilities than a lot of Colossus figures do. This is most notable in the face, which lacks the usual rounded features in favor of something more sharp and angular. While I can’t say it’s my go-to Colossus look, it’s certainly not a bad looking rendition of the character. The body continues some of the stylization present in the face; earlier renditions of Colossus tended to be more consistent in build, but this guy’s definitely favoring his upper body. He’s almost sporting Bruce Timm anatomy (though he’s definitely not Bruce Timm styled). There’s one oddity about the body sculpt, specifically the upper body: the upper portion of his tunic is separate from his actual torso. While it’s not out of the ordinary for such an element to be a separate piece, the fact that it’s not actual fixed in place in any way is slightly odd. There’s a fully sculpted torso under there, which leads me to wonder if there was a scrapped variant of this figure sporting his outback costume. Regardless, you’ll only really notice the separate tunic piece when picking the figure up, and it stays in place well enough. It also adds an extra dimension to the figure, which is always cool. In terms of paint, Colossus is very nicely rendered. The colors are all nice and very vibrant, and everything is very cleanly applied. There’s a nice subtle accenting to the yellow portion of the tunic, which keeps it from being too plans. I also quite like the metallic work, especially on the arm bracers. 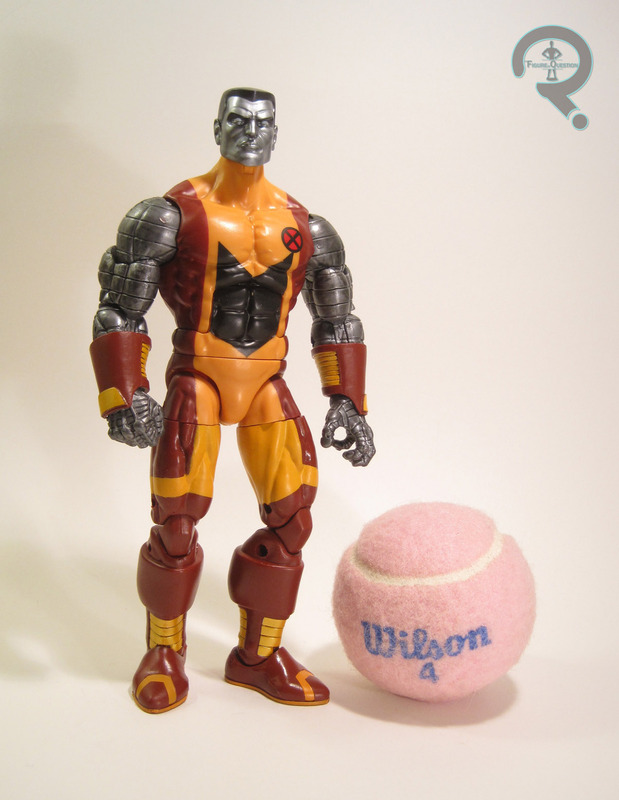 A lot of the X-Men Select figures included a section of the Danger Room as a display base, and Colossus was no exception. Well, generally speaking. He comes with a spike wall, clearly meant to be from the Danger Room, but it’s not exactly a stand, since it doesn’t really support him. Still, it’s a cool piece, and a nice addition to the armory. Colossus was my second Marvel Select figure, picked up during Cosmic Comix’s Biggest Sale of the Year in 2012. I had initially been planning to pick up Ultron during that year’s sale, but I got a subscriber coupon a week prior and got him then. I still wanted to take advantage of the sale, and I’ve always liked Colossus, so this guy was my next choice. The old Marvel Legends figure has always been one of my favorites, so this guy had quite a bit to live up to, and I think he did just that. He’s really just a very fun figure. Marvel Minimates has pretty consistently been the flagship of the Minimates brand, but it hasn’t been without its dark periods. Every fan has their own personal preferences, which means that where exactly the low points of the line lie can vary from person to person, but pretty much everyone agrees that Series 12 and 13 are probably the worst the line ever got. It’s no coincidence that immediately after those two series, the line started taking quick strides in innovation. The line looked like it was on its last legs (Series 15, set to be released not long after, is the only specialty assortment in the history of the line to be cancelled), and something had to change. Fortunately, the line did change, and it has continued for almost another 50 series, but man, somewhere there’s an alternate universe where these were the last Minimates we ever saw. 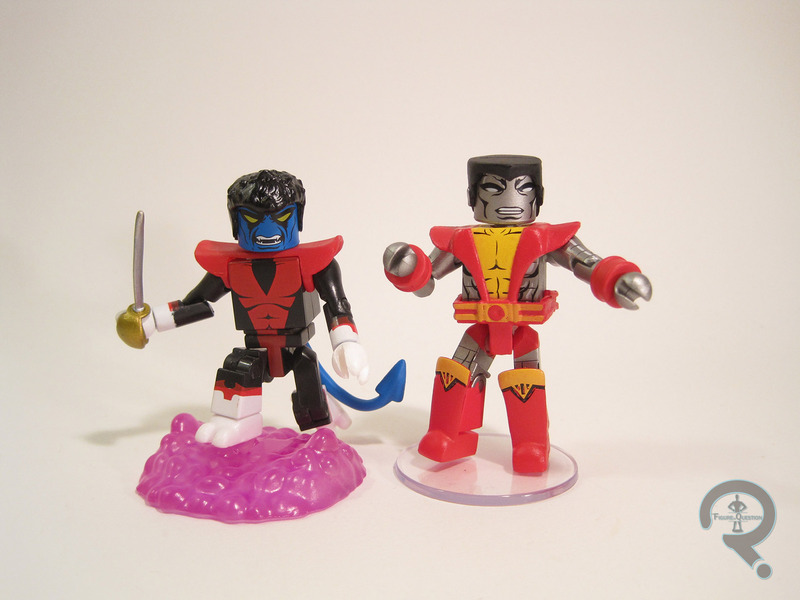 These two were released as part of Series 13 of Marvel Minimates. The series was based around the then current Astonishing X-Men. This is the variant set, which swapped out a “Days of Future Past” styled Wolverine in place of the regular Astonishing one. Or, as he’s known on the box “DOFP Wolverine.” I mean, I know what that stands for, but you’ve got to imagine that somebody stood there looking at the box wondering what the heck a “Dofp” was. I just recently looked at the new and improved take on this design from earlier this year, which I quite liked. This one is….different. 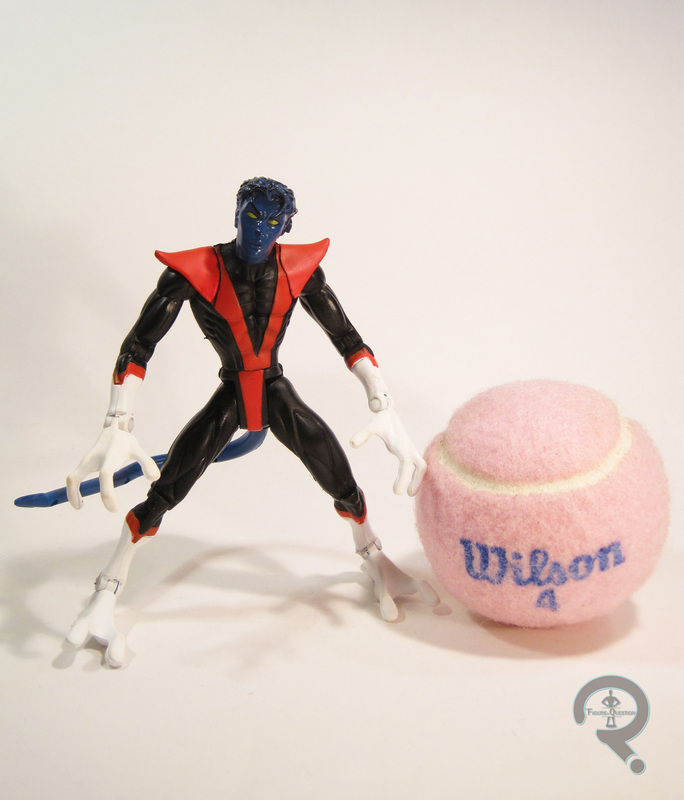 The figure is about 2 ½ inches tall and he features 14 points of articulation. 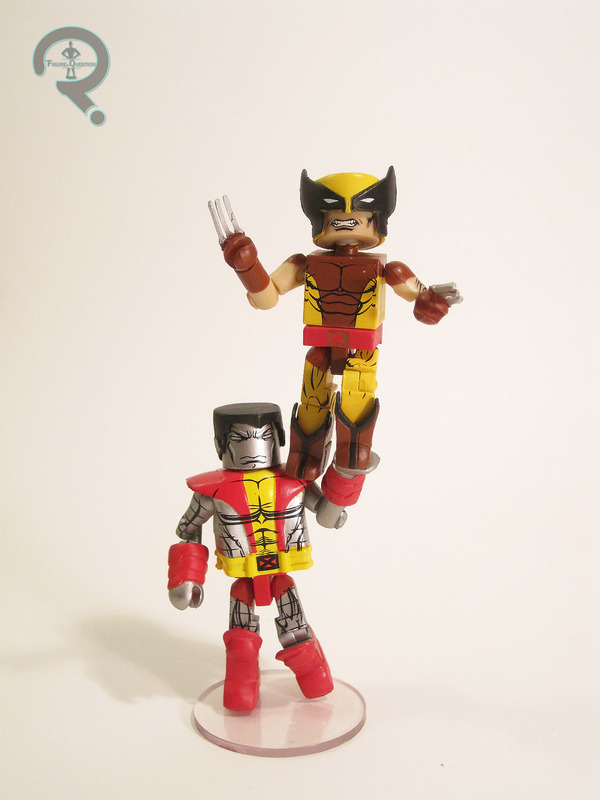 He made use of the standard Minimate body, with the then standard Wolverine claws in place of the normal hands, as well as an add-on piece for the hair. The piece, like every piece in this series, is a re-use, in this case from the Series 6 New Wolverine. What’s interesting is that the box actually shows the figure with the hair from the Series 3 Logan figure, which is a superior piece. Not sure why they made the change. Paint-wise, this is a pretty drab figure. I know the design isn’t the most vibrant to begin with, but there’s just no pop with this figure. The choice to make the jacket painted on robs the figure of a lot of dimension, and the jacket’s detailing is sub-par at best. I’m not exactly sure what the deal is with the face, either. He looks like he’s been… smooshed or something. And that’s not even starting on the whole double chin thing he’s got going. DOFP Wolverine had no accessories. Colossus’s return to life was an important part of the early Astonishing X-Men, so his place in this series isn’t too surprising. Plus, his history with Wolverine and his decent sized role in the original “Days of Future Past” make this pairing a pretty great one too. 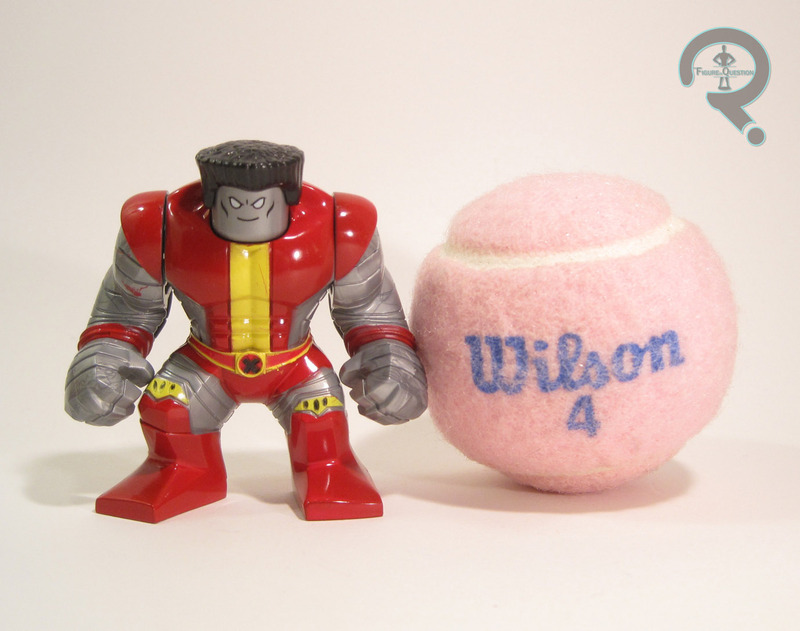 Colossus is roughly 2 ½ inches tall and he has 14 points of articulation. He’s based on Colossus’s look in Astonishing, which is just a slight tweak on his classic design, so it’s a reasonable look. 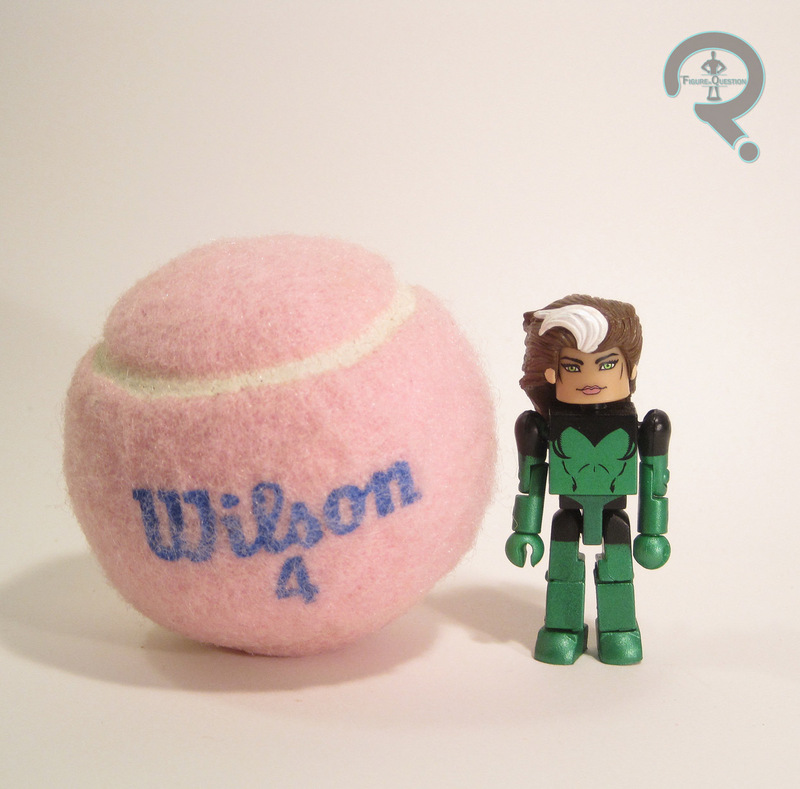 The figure uses the basic body, with an add-on for the hair. The hair is a re-use from the Giant-Size X-Men boxed Set Colossus. It’s a pretty cut and dry case of “if it ain’t broke, don’t fix it,” so it works nicely for the character. The lack of any other add-ons means that he’s a rather scrawny looking version of the character, which other versions have avoided. Colossus’s paint is at least a bit better than Wolverine. His colors are pretty good, though the red might be a touch too bright for this look. The detail lines are pretty nice, though not as sharp as they could be in a few areas. The choice to put the belt on the torso makes the waist seem too long, but at least it’s nicely rendered. 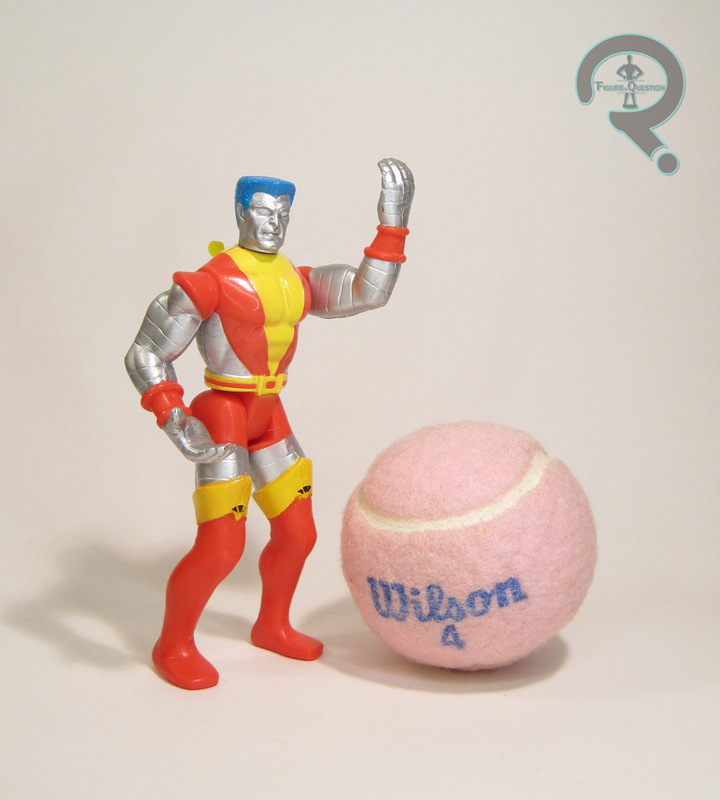 Colossus included no accessories. I picked up this set from a friend’s local comicbook store during a black Friday sale. I’m pretty sure I got it for slightly less than retail, which is probably a good thing. It was actually the first variant set I was able to track down, which is unfortunate to say the least. All in all, it’s not the worst set ever, but it’s one that’s seriously lacking. It’s fortunate that the line was able to move past this series and become better and more successful.